Christie’s projection mapping technology energizes the crowd at T-Mobile Arena in Las Vegas during the Golden Knights’ pregame show. There have never been so many ways to deliver an immersive video experience as there are today—from undulating tunnels of OLED panels to 200-foot-wide LED boards in stadiums, it’s an exciting time to be in this industry. But if you want to go really big (think Empire State Building big) there’s still only one way to get it done: projection. The rise in high-brightness projectors over the past few years is enabling video to grace all manner of surfaces—from the facades of cathedrals and skyscrapers to the playing surfaces of arenas—where fixed displays cannot be placed. 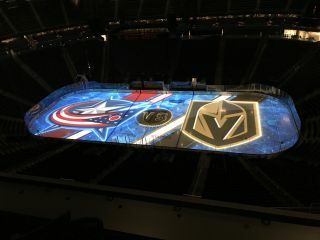 For some years now, projection mapping has been a fixture in professional sports, with many National Hockey League teams, like the Vegas Golden Knights, employing sophisticated pregame presentations that turn the entire ice surface into a screen. However, according to Mike Garrido, senior product manager at Christie—which supplied the projectors for the Golden Knights’ arena—this kind of technological showmanship is expanding into more widespread usage as well. To capitalize on this trend, Christie has recently launched the D4K40-RGB laser projector, which the company says is the smallest and lightest high-brightness, omnidirectional, all-in-one RGB laser projector on the market. Producing greater than 90 percent of the Rec. 2020 color space, and rated for more than 30,000 hours of operation to 80 percent brightness, the solid state D4K40- RGB laser projector is driving the exciting category of projection mapping forward. As great as projection is for these large-scale presentations, it’s equally adept at bringing more common, everyday things into a new light—and making them more appealing to the digitalfirst, Instagram-scrolling generation that will soon begin powering the economy. To capture the attention and loyalty of this demographic, retail and hospitality organizations are turning to projection technology. “Businesses are tapping into the flexibility and creative freedom of projection to create anything from large-scale displays—such as architectural mapping or life-size holographic entertainment events—to smaller uses, such as shelf or product activation at the store level, digital storefront, and operation efficiency use cases such as virtual inventory and wayfinding,” Del Mar said. Epson LightScene projectors are designed to help stores and restaurants sell an exciting experience and increase brand loyalty. These kinds of applications were the inspiration for Epson’s LightScene projector line, which it launched last year. A laser projector that simultaneously illuminates and projects on virtually any surface or material—such as narrow shelves in retail stores or glass windows for digital advertisements—LightScene can help give brick and mortar the pop of color needed to stay relevant in the digital age. When it comes to more traditional display applications, another advantage that projection has capitalized on over the past few years is its versatility. While flat panels have gotten bigger and bigger, projectors have shrunk in size—and with different lens options, you can place a big, bright image nearly anywhere. Featuring 4K HDR compatibility and a long-lasting laser light source, Optoma’s ZH506 is a flexible solution for verticals like classrooms, boardrooms, and museums. Soto highlighted Optoma’s ZH506T, ZU506T, and ZW506 as prototypical examples of the modern flexible projector. Featuring 4K HDR compatibility and a long-lasting laser light source, these models are also equipped with multiple built-in installation solutions, including vertical lens shift, four-corner geometric correction, and 360-degree and portrait mode operation, enabling minimal maintenance and improved ease of installation in professional environments. While direct-view LED has come down in cost, for many applications, it will be a long time until the price is right for its big-picture performance. For markets like K-12 education—which require large-scale deployments at a palatable price—projection is a great answer. According to Casio, the solid-state projection market has been expanding by more than 30 percent per year, and the company’s LampFree models like the XJ-S400UN are helping drive this growth. The biggest advancement in projection for markets like this is the move from bulb-driven architecture to solid-state design, a shift that Casio has been at the forefront of. “Although the overall projector market has been trending down an average of 5 percent a year (mainly attributed to the increase in flat panel sales), the solid-state segment of the market has been increasing over 30 percent per year,” Gillio said. The company’s line of LampFree projectors, which debuted in 2010, have been part of this uptick, and it has been implementing more features—like adding a suite of built-in collaboration tools to its network models—to make them more appealing than ever. Another reason that projection is so well suited to the education market is its ability to function as an interactive display, thanks to short-throw lenses. Like Casio, Maxell Projectors (formerly Hitachi Projectors) offers a wide variety of solid-state models, many of which incorporate interactivity. Using short-throw lenses, interactive projectors like those from Maxell (formerly Hitachi) can provide schools with a very large touchscreen experience at a much more affordable price than flat panels. In addition, through the company’s OneVision program, educational institutions can get access to specialized pricing, enhanced service, direct access to company experts, and program rewards—like offers to buy 10 projectors and get one free. Casio’s Gillio pointed out that by doing away with the projector bulb, the category has defeated many barriers of adoption. “Most complaints about lamp-based projectors are about the lamps, because they lose brightness quickly, run hot, and are expensive to buy, stock, and replace,” he said. “Solid-state projectors have no lamps to replace, no filters to replace, use less electricity, run cool, and rarely overheat.” In addition to using less energy, there’s also no harmful mercury to dispose of—all great things for the environment. And of course, it’s great for the total cost of ownership, a factor that gives projectors an edge over competing technologies. “From higher resolutions to built-in installation features, projectors offer greater cost-per-inch value, with the ability to cast large images at lower price points competitive to other display options in a variety of environments,” said Optoma’s Soto. Considering all of these factors, it’s safe to say that projection will continue to serve as a core solution in the AV technologist’s toolkit for a long time to come.